William Huskisson PC (11 March 1770 – 15 September 1830) was a Britishstatesman, financier, and Member of Parliament for several constituencies, includingLiverpool. 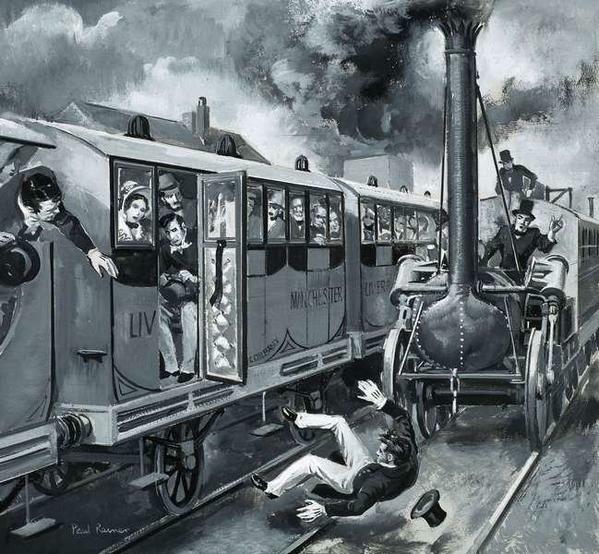 He is best known today, however, as the world’s first widely reported railway casualty as he was run over and fatally wounded by George Stephenson‘s pioneering locomotive engine Rocket. While attending the opening of the Liverpool and Manchester Railway, on 15 September 1830, Huskisson rode down the line in the same train as the Duke of Wellington. At Parkside railway station, near the midpoint of the line, the locomotives made a scheduled stop to take on water. Although the railway staff had advised passengers to remain on the trains while this took place, around 50 of the dignitaries on board alighted when the Duke of Wellington’s special train stopped. One of those who got off was William Huskisson, former cabinet minister and Member of Parliament for Liverpool. Huskisson had been a highly influential figure in the creation of the British Empire and an architect of the doctrine of free trade, but had fallen out with Wellington in 1828 over the issue of parliamentary reform and had resigned from the cabinet. Hoping to be reconciled with Wellington, he approached the Duke’s railway carriage and shook his hand. Distracted by the Duke, he did not notice an approaching locomotive on the adjacent track, Rocket. His leg was horrifically mangled. The wounded Huskisson was taken by a train (driven by George Stephenson himself) to Eccles. When he reached hospital he was given a massive dose of laudanum. After being told his death was imminent he made his will, and died a few hours later.